Let’s celebrate Thanksgiving with a bountiful kitchen scene from 19th century America! This really isn’t going to be about a “woman’s domain” or “only women cook”; believe it or not, it’s about a pioneering woman artist. As I have repeated (probably ad nauseam to you all), I feel there’s never been a period in art history when women have not played a significant role. So, one of my thanks at Thanksgiving is for the wonderful history of American art that includes the broad spectrum of the people in this country: encompassing women, African Americans, Native Americans, and all of the immigrants that have made the cultural diversity of this country so rich. Until the 1870s, women were not allowed into the major art schools in the US. Like their European counterparts, they relied on training from male family members or husbands who were artists. However, there were some vigorous women artists in the first half of the nineteenth century who defied convention in order to achieve their goal to be professional artists. Lilly Martin Spencer was one of those women. 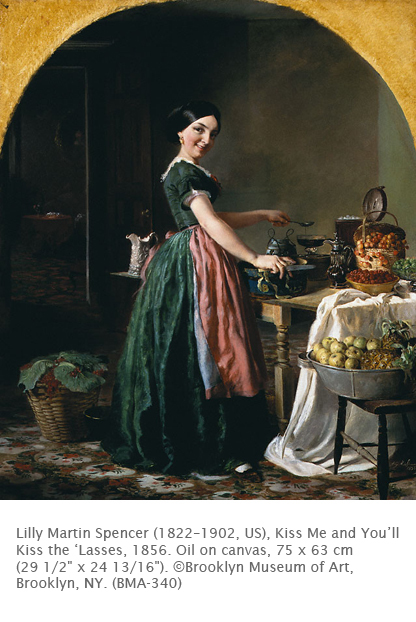 The period before the Civil War (1861–1865) in the US witnessed the rise in popularity in the US of genre painting, particularly scenes of American life. American artists at the time consciously strove to establish an American “school” or art. This perhaps explains why Spencer turned down an offer by a wealthy Cincinnati patron in 1841 to study in Europe. She had taught herself painting at home with the ardent encouragement of her liberal parents. After lessons from local Cincinnati painters she started exhibiting wherever she could in Cincinnati. Her marriage in 1844 did not slow down her career, for her husband took over domestic duties in order to allow Spencer to continue to paint. Sales through the Western Art-Union of Cincinnati starting in 1847 was the beginning of a very successful career. Such art unions sold lottery tickets with engravings of American artists’ paintings, with a drawing to present the painting itself to the winner. These drawings exposed Spencer’s work to a wide section of the American public. Although she did some portraits, Spencer preferred to concentrate on genre scenes, specifically family life (she herself had borne thirteen children). She studied at the National Academy after moving to New York in 1848. Until the time of the Civil War, her genre scenes vied in popularity with the most notable male genre painter of the period: George Caleb Bingham (1811-1879). This work was commissioned by the Cosmopolitan Art Association in New York. The association promoted art by women for women. However, the protagonist of this work threatens a spoonful of molasses in the face if the (presumed) male viewer tries an improper advance. The painting is an interesting combination of traditional subject matter with unconventional boldness. The irony is that Spencer was a woman supporting her family by portraying women in seemingly traditional roles. Her handling of the still life arrangements within the painting and the overall domestic scene indicate that Spencer was well aware of Dutch Baroque painting, which emphasized genre and still life. Activity: Using pencil with colored pencil or markers, have students create an interior that features a common activity in their family, with emphasis on a figure in the work (whether themselves or a family member) interacting with the viewer. Hello, that was such an exquisite and interesting article here. It was so great to find out all these ample and fascinating facts here, such an information is always a plus to any person's education.